Hi Inspyromancers… I trust you all had a wonderful Christmas. I did (although it wasn’t without its own share of drama!) I broke my diet, picked up two kilos, and am back on diet again. Can you believe it’s almost 2019? I can’t! Where did the year go? Oh yes, writing books. I’m so excited to introduce you today to my author friend and fellow South African, Ashley Winter. Ashley and I met on Facebook a few months ago when I posted one of those cutesy baby pictures (you know like Anne Geddes started doing way back when? Oh, I’m giving away my age now?) I said something about that being an awesome job and Ashley posted on my page saying that was her day job. What a lucky girl! But not only is she an awesome photographer, she writes books too. I invited her here on Inspy Romance today, to talk a little about her writing journey and to introduce you to her gorgeous Christian romances. “I love stories – watching them, reading them, telling them, writing them. Stories take people on a journey. Some are powerful enough to change the way people see things. They can uplift, encourage and empower. And if the message is filled with hope in Jesus, stories, even fictional ones, can change lives. Writing sows seeds throughout the world and across time. This is why I write. I believe there was always something in me to write; to create something with words that would take others by the hand and lead them on an adventure I imagined. But, as a young South African girl tucked away in the small town of Dundee, there was an obstacle I couldn’t overcome. It may seem silly, but I was taught to ‘write what you know’, yet I had never read the sort of book I needed to write. I’d never read a Christian Fiction book set in my own context, in my own culture. It seems crazy now, but I couldn’t imagine that the rest of the world would be interested to read books set in South Africa. How wrong I was! My thinking changed after reading a novel by Marion Ueckermann, called The Other You. Like I said, stories can change the way you think! It enthralled me completely! It was everything this South African girl was longing for in a novel. Something was birthed in me then. I knew we needed more Christian Fiction set in my beautiful country, with its rich cultural diversity and complicated history. My family encouraged me to go for it. Being surrounded by people who believe in you is invaluable. As I started writing, it took ahold of me and I discovered a whole new side of myself. It was exciting, challenging and extremely revealing! Writing romance leaves the author feeling particularly vulnerable! Once my family recovered from the shock of the kissing scenes (blush, gasp, oh my goodness, I can’t believe you wrote that!) they became my biggest fans and are now my passionate alpha readers. The last year and a half has been an absolute whirlwind! I have loved every moment of creating my all-South African Christian Romance series, Love in South Africa. The series begins with Rachel’s Blessing and should be read in sequence. The first six books have at least one main character from another country. This allows me to introduce the South African culture to international readers through a foreigner’s eyes, so that non-South African readers can gain understanding and become fully immersed in the story. Living in the United Kingdom for over nine years now has given me the tools needed to write my British characters with some insight. I have just released book ten in the series, Mariaan’s List, and am planning a prequel for book eleven which will take readers back into the South African apartheid era. Follow Ashley on her very active Facebook page. 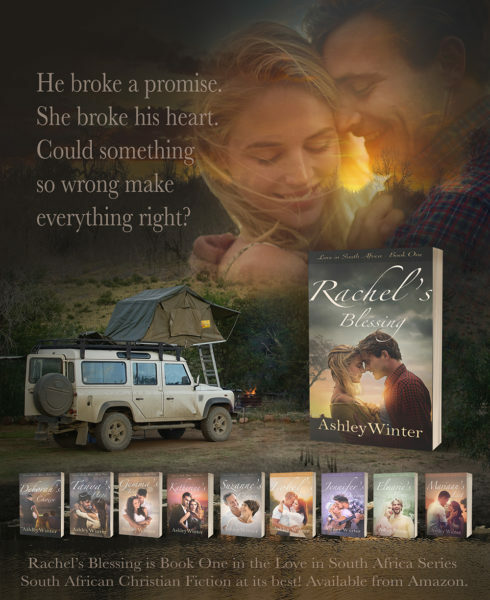 All Ashley’s gorgeous books can be found on her Amazon author page, or you can join her Facebook Love in South Africa Book Club. Book 1, Rachel’s Blessing, is available for free to all new subscribers. Just click here. And not only is Book 1 FREE, but Ashley has kindly offered to gift Book 1, Rachel’s Blessings (without having to subscribe), AND Book 2, Deborah’s Choice, to one reader who comments on this post. Winners will be chosen in a week and announced on Sunday, January 6th 2019. Ashley Winter is a South African Christian Fiction writer living in Wales, United Kingdom. 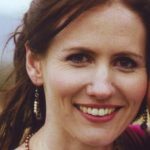 Ashley and her husband Grant, along with their three sons, immigrated to Wales in 2009 to help with a church plant in Swansea. They have since had one more son added to the chaos, and they spend their days chauffeuring the kids and kicking them off their screens and other electronic devices. They have not been brave enough to add any pets to their collection of living things, as they already have so many to keep alive. Ashley finds her escape from the overwhelming masculinity in her home by disappearing into her wonderful world of fiction. Awesome and all of the best. I read Rachel’s Blessing this spring. Touching story. Eish, what a lekker series. Enjoyed the first book and can’t wait to read the rest. I love series. I won’t start reading them until I have them all. Lol, you have some willpower there, Audrey. I am currently reading book 7 in Ashley’s “Love in South Africa” series. I have enjoyed every book thus far. I’m looking forward to reading the next one in the series. I enjoy het style of writing. 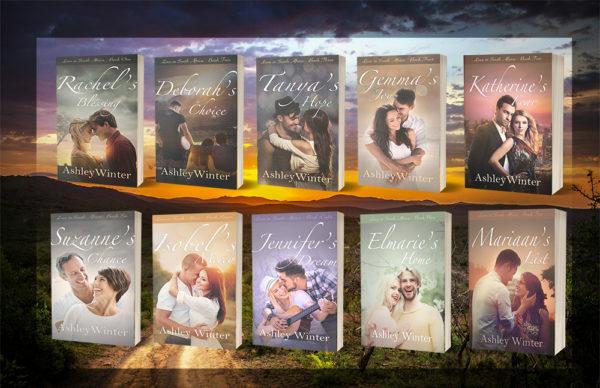 Wow I am so excited about these books.I can’t wait to read them all.Ashley Winter is like a fresh new breeze in the world of Christian fiction. Wow, thank you so much Saretha! I hope you enjoy them! Hi Marion. Welcome Ashley! As a mother to three sons, I so relate to escaping from a male dominated household into a good book. I am always interested in a book with an international setting, especially now as a retiree and being an arm chair traveler. Best wishes and Happy New Year. Yes! I just love meeting new authors! Thank you, Marion!! Hi, I loved reading book 1 and 2, and would love to read the others in the series. Now that my granddaughter has a device to read the series on I am super excited to share the books with her. That’s fantastic, Vanessa :) Happy reading! Ashley, I can’t wait to read your books. Marion, Thanks for introducing me to a new author. I really need some good books to read! Have discovered Ashley’s books recently…WOW!! You’ve made me so happy with this lovely comment, thank you Chrisna! Thank You Ashley for sharing the love of God through your stories and for teaching us about South Africa. God Bless You! Wonderful, Kim :) Happy reading! That’s wonderful, Dalyn. About two decades ago, when my brother-in-law still lived in the town of Greytown, he was good friends with Angus. My hubby has also been to one of his Mighty Men conferences. Love Angus Buchanan! He preaches in my home church once a year and we got to visit his farm once. I also got to play keyboard in his band when he did an outreach in my town :-) What an amazing man! One of my close friends who’d I’d prayed for for years became a Christian at that outreach! He was the first one up to the front, all on his own. I’ll never forget it. The man really inspires me! Lovely! I am through books 1-4 and really enjoying them…being on a tight budget I can’t buy every month but looking forward to books 5 and onwards when I get there! That’s fabulous, Charmaine. Well, maybe you’ll be fortunate enough to win and you’ll be able to get the next book you need for free from Ashley, as she has kindly offered to do so if readers have read books 1 and 2. Would love to be the winner of your books to start reading. Sounds great. All the best in the draw, Lizelle. Remember, Book 1 is free if you subscribe to Ashley’s newsletter. I love Marion’s books and I’m thrilled to find you, a new-to-me South African author, I’m looking forward to reading your books. I’m also from South Africa, but relocated to Ireland earlier this year. We miss you this side, Ruth, but thankfully our Whatsapp connection still remains strong :) Hope you get to read Ashley’s books :) Don’t they look wonderful? This sounds like a great series! Back before “Love Inspired,” Harlequin romances we’re all around the globe, and my favorites were usually in Africa, Australia, or New Zealand! I’ll be looking for your books, Ashley! Thank you Regina! Hope you enjoy the series! South Africa is a wonderful place for a romance! Lord bless the chaos!! I raised three kids while doing in home daycare and teaching several kids classes at church. We always had a house full of munchkins during the day and college kids in the evening. It was a crazy blessing. We’ve retired near our grown kids and grandkids and are enjoying that season of life. The house can get awfully quiet so its handy to have everyone nearby! Sounds wonderful, Diana. We need to enjoy every different season of life to the full. It’s wonderful to have grandkids nearby … mine live next door, so we see them almost every day. Ashley’s covers are amazing…I’m in love! Aren’t those covers incredible, Natalya? Sigh, yep, blink and Christmas was gone, although I must admit that I’m looking forward to getting back to normal. Looming deadlines, that should not have been looming had my writing plan not got thrown out of the window somewhere in November LOL. May 2019 be wonderful for you. Ooo thank you so much, Natalya! I just downloaded the free copy. Can’t wait to start reading. Hooray! Hope you enjoy it, Lee-Ann! These stories are inspiring and entertaining. I love how pur beautiful country is portrayed in your books. Loved Rachel’s Blessing. I read the whole book while on route to PE. Keep up the great stories in 2019! Hope to see them in hardcover very soon. This is wonderful to hear, thank you Ronel! Rachel’s Blessing is now available on Takealot. I’m hoping that it sells well so that they list the next of the series also! I’ve just started on book eleven and I’m very excited about it! This is such good news… congratulations Ashley! Loved reading Rachel’s Blessings. Excited to follow Marion in future too… All the best for this exciting new venture as a guest writer. I absolutely love Ashley Winter’s books. I enjoy the “South African” feel that each book brings and would highly recommend them to others who want romance, humor and drama in the books they read. Just a warning: You might need to have tissues handy when you read this series. It really tugs on your heart strings. I am so glad that my sister introduced me to this author. Looking forward to learning more about your country! Ashley’s books sound awesome!! I would LOVE to read her books!!! Blessings to everyone for the New Year 2019!! Just catching up after being away for Christmas, so I’m glad I didn’t miss this drawing! Ashley’s books sound very intriguing! At least if I don’t win the draw, I can get #1 to start on the series :-) Happy New Year to you all! Oh yes, Margaret. Win-win, whichever way :) Happy New Year to you too, and happy reading! I love that you decided to use characters who are not from South Africa in order to help introduce the reader to your culture. What a cool idea! I enjoy reading stories that take place in other countries, and learning about them while enjoying a good book. Ashley is a new author to me her books sound very interesting Thank you for the chance ! And Happy New Year! Congratulations, Regine Franklin, on winning Ashley’s books. Ashley will be in contact with you (if she hasn’t already). Thank you everyone for commenting. I hope you get to read Ashley’s books.